The Timber Creek™ Smoking Tray was designed to let you easily and inexpensively smoke your meats or vegetables to perfection. Follow these easy directions for a delicious meal. Remove label and adhesive dots before using. Do not add additional moisture to tray such as marinades or water. Only cook with thawed meat or vegetables. If you prefer grill marks on your food, try searing the food on both sides for approximately 1 minute before adding to the tray. Due to variances in grills, cooking time and temperature may require adjustment. Keep grill lid closed as much as possible for optimum smoke flavor and to keep the wood pellets hot enough to smoke. Always cook your food to the appropriate temperature. Pre-heat your grill and cook on high. Prepare coals outdoors and allow to burn down to hot white ash. 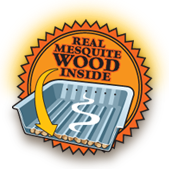 If you are using an 18" to 21" grill, please use 70 or more briquettes or approximately 4.75 lbs. CAUTION: Tray will be hot. Remove tray from grill with hot mitts or tongs. Contains real wood pellets and is intended for use in outdoor grills only for smoke flavoring, not for ingestion. One-time use only; never reuse tray. Never place tray in microwave oven. Keep foods hot. Refrigerate leftovers immediately or discard. Do not dispose of tray until cool. Smoking food takes more time to cook and may add additional grilling time. Plan your meal accordingly. Do not overfill tray with food. Get the best results with 1.5 lbs. or less food in the tray. Flavor will be stronger on thinner and smaller pieces of meat. For greater smoke flavor, loosely cover the tray with aluminum foil.